The Astone ISO GEAR 481U3 SATA to USB 3.0 external hard drive enclosure allows any standard 3.5-inch internal SATA Hard Disk Drive (HDD) to be made into a cost-effective external SuperSpeed USB 3.0 hard drive. This USB 3.0 HDD Enclosure is backward compatible with USB 2.0, making it more than suitable for use with computers that don't yet have USB 3.0 ports. The meshed metallic case effectively draws away the heat to protect the inside hard disk. 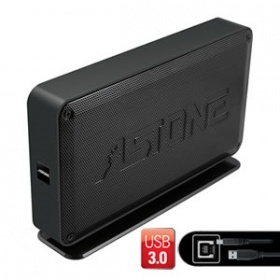 It provides the best solution to keep data between different computers up-to-date or to carry important information securely and conveniently. The data transfer rate of USB3.0 is 5Gbps which is 10 times faster than USB2.0. The Astone ISO GEAR 481U3 Hard Disk Drive Enclosure is the greatest solution to save time instead of waiting for data transfers.